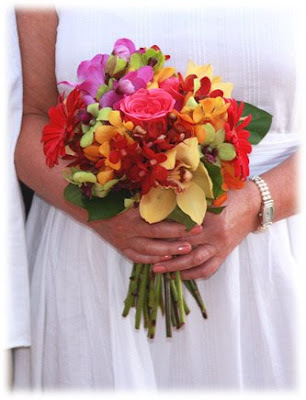 Tropical Flowers Bouquet by Dellables! Dellables had the great pleasure recently to produce this beautiful Tropical Bouquet for a lucky Bride of Maui Wedding Planners, JJ and Michael Beachwood. The tropical pallet is so varied and textured to capture almost every color in the rainbow. Tropical flowers are also GREEN, in that they require no jet aircraft to bring them to your beach wedding. We pick them, grow them and nurture them right here on beautiful Maui! Consider Tropical Flowers as something different, something wonderful and something good for Maui's precise environment.